What does the EFF result really mean? Let me firstly congratulate South Africa for again staging successful democratic municipal elections that is free, fair and transparent. Listening to the CNN broadcast on our elections will convince one the ANC has lost all political power, then again that’s CNN. I also wish to congratulate the DA for their securing of the Nelson Mandela Bay Metro, which confirms their aim to proverbially concur SA in elections from the Cape of Good Hope along its coastal line. Let me equally congratulate the EFF for having grown its voting footprint albeit by a 2% margin. There is no question that the EFF is a new kid on the block if its age is considered the only yardstick. In the aftermath of the now pronounced results as shared by the IEC, it is perhaps time to ask how do we interpret the EFF election and what does it mean in the bigger scheme of things. I am on record as can be confirmed from an earlier opinion piece, where I questioned the continual existence of the EFF beyond its antithetical twin-personality of origin namely Jacob Zuma and Julius Malema. In such I maintained that the EFF primarily and fundamentally exists to dethrone Jacob Zuma in vengeance of a Julius Malema expulsion. I stated when either of these two might for whatever reason leave the political scene the relevance of the EFF will prove obsolete. In case you think what is he smoking, because the EFF has performed so well. I still hold today the same stance. It is two years later l hold it is confirmed that the EFF cannot shed its original reason for its existence and remains trapped in such therefore muzzled in not finding policy relevance. The EFF simple cannot untie itself from a Malema as the epicentre of its daily life and he is entrenched as the EFF and the EFF is Malema. Journey therefore with me as I try and make the case that we are not reading the elections results of the EFF in soberness of mind. We not looking at the time we are living in neither the state of the ANC in this election as its weakest ever in election history. There are perhaps two important issues that are conveniently left in abeyance in our current elections results. One being the true state of the ANC and the secondly the new role of kingmakers for coalition government. One does not mean to pour cold water on the performance of the EFF, for that would be completely uncalled for and made out as a form of sour grapes. The success escapades of the EFF is pronounced in admiration of accolades and equally dovetailed with a claim of them being only 3 years old. It is today the kingmaker in at least 3 Metro municipalities. Its status of kingmaker is today the talk of town, to the extent that they plausibly misread their actual election results. What is perhaps completely forgotten, as fact is that the ANC came to these polls in 2016 the weakest it has ever been in any election before? It came to the polls with all sorts of own goals; a known failed often-reactionary communications strategy immanent in emptiness of synchronized message, theme or even strategy. It could not even muscle a proper read of all Madiba’s sayings on the opposition to stymie off the recasting of Mandela as DA member. The ANC came on the back of an Nkandla bloody nose, a Constitutional Court ruling, violent unrests and a generally unhappy inside and outside voter. Admitted factions around twin personalities as Tshwane a month before the elections in violent infrastructure destruction and loss of life confirmed. Abrupt leadership change in Kwa Zulu Natal. Threatened court cases from some provincial leaderships personalized or organization based. The ANC entered the elections with some preoccupied in jockeying for a coming 2017. The ANC started its campaign riddled with a barrage of unnecessary communication gaffes, retractions misstatements and a collision cause with SABC leadership. This was negatively crowned with unnecessary deaths of candidates from KZN and the Eastern Cape. It allowed the EFF to set the tone of filling stadiums as a subject of importance, something the ANC never has done before. This season saw an ANC with list nomination challenges more prevalent than ever before. It came to the polls with a Gauteng leadership as always preoccupied with national leadership with careless statements of ” don’t punish us because of Zuma”. (What confidence does any leadership exude to go to voters asking vote for us, despite our president). This clearly may backfire when provinces at the soul search and introspection Indaba are called to account for their mediocre election performances. It is fair to say the ANC entered the elections arena, punch-drunk and wobbling, in dizziness of having to contend with too many wars. Considering the above affords me to conclude the ANC therefore was at its weakest in this season. Any party contesting an election with these aforementioned counting against it would naturally haemorrhage in that election and may even be completely without power. Yet the final tally confirms the ANC secured 54% of the National vote, the DA 27% and the EFF 8%. The elections by municipalities attests the following the ANC confirms 168, DA 24 and IFP 6, with 26 smaller hung Councils. The rough claim can thus be made the actual drop of 8% on the part of the ANC from its 2011 Municipal elections is really that which the EFF today claim as theirs. The EFF on average received 8,3% of the national vote meaning the EFF improved 2% on its debut it made in 2014 national elections. The result of the EFF attests not a single municipality anywhere from the smallest to the largest. It is here I wish to postulate the EFF obtained 8% election result when the ANC was at its weakest ever. I dare assert that the ANC will never be this weak again if sense prevail. This was also for record sake the official last elections that the Jacob Zuma factor had to be added into the equation. Now if the EFF in such season as now can with all the grudge of ANC voters only amass 8%, how will it perform with a reasonably stronger ANC? In particular and ANC devoid of the undeniable weaknesses we have lived through? The EFF must therefore ask itself notwithstanding claims of limited resources and a 3-year age why didn’t SA in this season of total ANC weakness entrust it with any of its municipalities if its message so much resonates with the claimed masses of SA in being unhappy with the ANC. Is it possible that we have seen the best performance of this 3-year-old party, who clearly derives its meaning, purpose and fixation in a current ANC president who will never be present in any election by 2019? The second aspect of my argument of an interpretation of the EFF elections performance vacillates on the fact that emanates from its king maker status. We must equally ask how will the EFF perform when it is now a coalition kingmaker. We have heard its chairman Mpofu expeditiously in simplicity of claim pronounce they will have coalitions with all but the ANC. Clearly this was a shortsighted perhaps angry statement bereft of the reality of politics where there are no permanent enemies or friends. Perhaps one may assert the EFF stands before its first real ideological and principal challenge. Is this its first proverbial Rubicon? It has never been here in its brief political life and has never had to engage the nagging but very real subject of coalitions which usually has a tendency to make the smaller party or dealmaker a add on of those it determined to go with. They say history repeats itself; COPE perhaps the maximum symbol for ANC breakaway parties in vengeance was here too. It in another season of ANC vulnerability in recall of its SA President was birthed in anger and went on to score what was deemed a significant 7% in national elections. However COPE is today for all practical reasons history in relevance and the case can be made it exists today perhaps to maintain the retirement upkeep of its dwindled leadership. 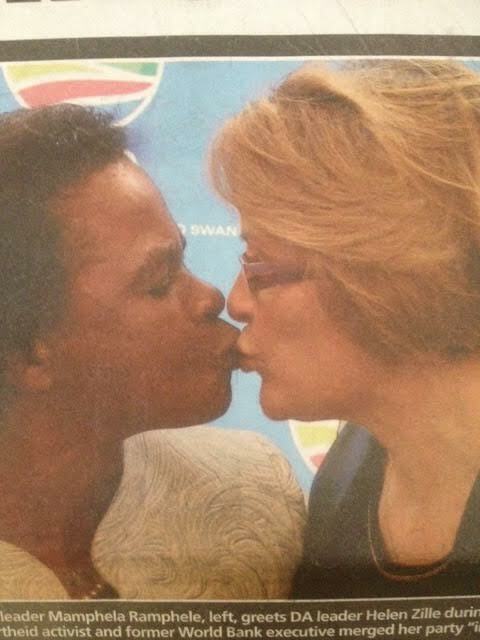 Is this the high moment of the EFF no dissimilar to that of COPE? The EFF’s ideological challenge resonates in this that if it opts to go with the DA, it would have committed political suicide at least at an ideological level. They then will no longer be able to accuse the ANC of its early in democracy National Party agreements that resulted in the economic slavery of the black masses. If it decides to go with the ANC, because it is known as light in true policy footprint will see it absorbed as advocating ANC policies. By the way the same policies they accuse the DA and ANC to share in neo-liberalism claims. It furthermore runs the claimed reputational risk in the eyes of its voters of now associating with the very party from which it was birthed in vengeance. A party it has vilified, sold to SA as corrupt, its leaders self-serving and a party that betrayed the revolution for true economic emancipation. How will it’s voters trust it to be ideologically sound, reputational clean and functional in visionary outlook. Thus the EFF’s success in this election may turn out to be its real Mt. Everest in highest moment of societal consciousness. It may become its true Rubicon and its defining new identity, which may see it gradually, decline, since its performance in this season was due to and ANC that was at its weakest. Also having to make bedfellows with both the DA and ANC does not help them in singularity of political relevance. I hold the hope the ANC will never be in the foreseen future find itself in such weak position as evidenced in a toxic combination of own goals, lack of leadership credibility, recognised factions, a strive for material gain and a blundered campaign. I hold beyond, campaigning and theatrical parliament games of insult and a Jacob Zuma fixation can the EFF live to see another day of elections (2019) when it based on its current success stands confronted in its first true existential ideological test and Rubicon this season. Can the EFF live to see another day beyond a Zuma who has just participated in his last elections as a central figure? Can the EFF’s current hegemony around a Malema personality as its true north withstand the unforeseen but real implications of coalition governments? Will it too be finding itself tearing itself in factionalism apart with court cases where personalities no dissimilar to COPE contested for leadership? Why Opposition Parties get it wrong in SA Elections? Trevor Noah SA’s finest export in modern day stand-up comedy is famous for quipping, in his THAT’S RACIST show ‘you gonna learrrnnnnn….” I involuntarily thought of this when I surveyed the behaviour, messaging and tactics of our Opposition Parties in this season of elections. Voting has for all intends and purposes begun in this our 5th National Elections 20 years on in democracy. The international registered and vetted voters have exercised their democratic franchise and the special vote category is voting between today and tomorrow. In 36 hours from now the official May 7, 2014 Elections would be in full swing I would have cast my vote and be readying myself to wing out to cross the Atlantic Ocean to attend to some speaking engagements. This occasion affords me time to assess what Opposition Parties are up to as measured by the respective campaigns they ran. The aim is not to give an in-depth analysis of each opposition party but to look at trends and to understand it in collective definition. It is my contention that the collective of Opposition Parties in SA remain bereft of true respect for the Voting Masses if their tactics, messaging and themes constitute the yardstick for assessment. I will argue Opposition Parties have confirmed preconceived notions that are cast in stone on who the voting masses are and how they must be approached. This is leading to the perpetual missing of the proverbial bulls-eye. I have distilled 12 errors Opposition Parties make on the SA voting populace because their campaigns and tactics exhibit these trends. The first error the collective of Opposition Parties made was to abandon their respective Manifestos. We must also hasten to add that is if these manifestos have existed in the first place. They rushed to tag their entire election campaigns on the emotive public topics such Non- Service Delivery and the long awaited Public Protector report on Nkandla (the security upgrades at the president’s homestead). The Opposition Parties somehow fell for the untruth that service delivery is not happening in SA, this despite every authentic report of an assessment of SA over the last 20 years attesting and confirming tremendous delivery. In fact the City Press at one point in 2013 ran a story in which they captured this administration as led by JG Zuma in ascribing him a title of MR DELIVERY. How the host of Opposition Parties allowed themselves to fall for this when they know basic services have been consistently improved over the length of ANC governance defies logic. The second aspect was the PP Nkandla report. The DA has spent millions on its Gauteng media campaign driven purely by this as anchor theme. It is my view their Manifesto suffered because it took a backseat to this topic which in the greater scheme will have no true impact on the elections outcome. The DA’s dream of an impeachment (the word does not exist in our Constitution), drove them to appeal to the Speaker for an Ad-Hoc committee to look at the report and the President’s response. Hats off to the speaker of parliament for respecting the request, yet the DA had attempted to make this ad-hoc committee a court and quickly found out, that they in a proverbial cul-de sac and constricted zone because they will get nowhere with this campaign. As we speak now the ad–hoc committee was absolved and therefore has no bearing in claim of desired influence on the May 7 elections. This was a major blow to the DA because it pinned its hopes on getting a ruling from this before the elections. What wishful thinking? Nkandla as emotive and sentimental it may portend, simply cannot become ones whole Manifesto. Nkandla, I have argued is perhaps the most dishonest debate we have had and we might repeat it because we have not allowed ourselves to rise in thought beyond the noise. We easily paint people into corners of for or against, and thus drum out to the necessary opinions of others who share not our confirmed views on the subject matter. It is for this reason that I hold we are prone to repeat it again because we are not affording ourselves the candid and necessary engagement of the subject matter in order for us to learn from it. Opposition parties have proverbially hatched their bets on the damning impact an Nkandla will have on this election, yet those who think along these lines constitute a specific sector of our society defined as a public in publics. The thin and often overexerting chattering class are spoiled to assume that when they see it a certain way, the masses must equally see it similar way. The president tonight stood up and spoke frankly without any written speech (I somehow think he always does better when he has no script with him) on the subject and in his own colloquial way captured my assertion, ‘ Nkandla does not concern the people it is a topic for the clever people Nkandla has become the concern and interest of a vested group making up the middle class who erroneously assumed that this matter is a critical matter for the masses. When we argue this here we are not advancing a moral judgement on the wrongs that occurred but we are arguing the salience in relevance for this issue to affect and impact the ANC’s march to its 5th consecutive beyond 65% victory. You simply cannot superimposed this occurrence as preeminent to the consistent good story we people have lived through in the two decades of democracy. To assume that the masses of SA citizens are uniquely concerned with Uganda’s most recent laws on homosexuality is to misunderstand the voting populace of SA. Regardless to how strong a lobby group for a certain subject may be resourced, it is no guarantee that it will alter the cause and direction and outcome of the elections. The collective of opposition parties in SA as led by the DA continues to make the ANC the departure point and end- point of all their campaigning. In defence of the opposition parties’ one must hasten to add, it is almost impossible to ignore the ANC as ruling party in your contest. The challenge however is if you narrow and hone your entire campaign on the ANC mistakes errors and wrongs you really act as an amplifier of the prevalence of the ANC in the minds of society. A classic example of this is the ANC in its manifesto has committed itself to create 6million job opportunities. The DA then challenged the ANC so much so that it even attempted a staging a march to COSATU -House to blackmail them to agree on what they term 6 million real jobs. The DA’s campaign then became ‘6million real jobs’ which means the DA is not even original in the number of jobs as a target bit borrows this directly from the ANC. No one in the DA was conscious of the fact that if they had for example said 8 million real jobs they would have been dislocating them from the ANC directive of a 6 million job opportunities. The DA has declared this the elections of JOBS. Hence this means for this party this is the flagship issue at stake for 2014. You would have thought that since they made this their flagship they would have proven leading in defining this distinct and separate from the ANC who has concluded 5 aspects in its Manifesto of which job creation is one of the five. The negative side of this when you spent all your time and energy telling us what the ANC does wrong, without telling us what you will and can do in a systematic and coherent sense, reduces one to whinger who rants and raves at anything therefore empty of true input. This aforementioned issue of 6 million jobs cited is a classic approach in trapped state of tactics as to how opposition parties think, internalise and actualise their role and meaning in our society. 4. ATTEMPTING TO PLAY ON THE IEC AS A COMPROMISED ENTITY. The fourth error opposition parties as led by the Bantu Holomisa of the UDM made was to attempt claiming the IEC as compromising for the presence of its election chairperson as not fit to lead this pristine entity. Now the argument Holomisa raises is not a wrong one, yet where he blundered was to overextend this claim in an almost attempt of arguing the elections will be compromised because Pansy Tlakula is the head of it thus potentially rendering the elections as cooked. This when Holomisa and all those who constitute the 5 opposition parties know is a complete sophism because the IEC as a Chapter 9 institution has since inception been an exceptional entity and has delivered elections devoid of any compromised claims. The integrity and performance of the IEC was always above board and a cooked election has no true context of defence. The error here on the part of the Opposition parties is the emotional campaigns they attempt almost in a sense of blackmail. Another error opposition parties committed is to try and run campaigns on victimhood. We have seen how the EFF led this charge in which it wants to blackmail any and everything including the SABC arguing they must be afforded equal space on broadcasting time. The truth is the EFF and Agang-SA has never been voted by anyone into any office and therefore cannot pretend as if they already have attained this place of significance. Regardless to all the collective mass rallies of varied conflicting numbers in attendance, as we sit here today, the EFF and Agang-SA and all new parties have no right to argue they are a party as tested in election embrace. Therefore to pretend victimhood in claims of the ANC being advanced by the SABC is a false argument. The voters understand this and to assume they do not is to not read the voters correctly. Concerning those parties who have already participated in elections they fully understand that they are not competing with the ANC in attempt of dethroning it but for a space to be a part of the voices of opposition. The opposition parties in SA have developed campaigns, themes and messaging around what I choose to deem a convenience of distinct segmentation of the SA voting constituency. We have seen the strong focus on the youth as claimed by those who thought they could get the 656000 votes of those born after the dawn of democracy. Forgive me I cannot legitimise the notions of ‘born –frees generation’ because I fully understand we will never be equal and apartheid gave some a head-start that my generation will never be able to wipe out. We must desist the temptation to assume that targeting these voters can automatically result in great success almost in a vacuum for their parents remain poor and struggling hence the issue of economic equality as corrected by a post-apartheid birth is sophistic to say the least. The bigger error with segmenting a voter populace in classed definition is also a misconception, whilst we may have present middle class of varied degrees you can hardly make these a unique target when middle class so broadly exists in experiential reality. The DA in Gauteng has decided to go after the middle-class. Agang-SA’s whole existence is in claim of this middle class construct. The truth is segmentation is necessary yet you don’t do it overtly and singularly in focus, The ANC understands the class hierarchy too but it refuses to be overt about it and continued a campaigned in which it advocates it is for all. The segmentation of voting populace inherently leads to a polarisation of voters which I the least of the core issues for a party seeking the voting populace. The challenge is the party that adopts the overt stance cast itself into a mould of being seen and experienced as middle class based. A shackle it will struggle later to undo. Perhaps the biggest error that opposition parties consistently make in SA is premised or informed by a view that people that vote for the ANC do so without thinking, and thus not conscious to choose clearly. This error has a precarious double edged internal stream; on the one hand it fundamentally argues the majority of voters are illiterate. On the other hand it assumes the votes can be swayed on emotions because they believe the voters vote the ANC in power informed by pure emotion and no effective and causal reasoning. Another error Opposition Parties made is to mislead them to be in the running to unseat the ANC. Each of the opposition parties are no differently to the EFF inebriated with the idea they can rule SA. Opposition Parties have not been realistic neither honest to accept they not campaigning against the ANC but against those who have been playing in the sphere of influence they operate and remains constrained. This utopia of thought and dream is paraded and fundamentally the cornerstone of all opposition lifeblood. Opposition parties have spent unnecessary resources time and energy on the wrong focus. They equally have equally erroneously convinced themselves that they can mislead the masses that they can unseat the ANC, unfortunately the voters do not agree with them and shows them exactly the opposite. The collective of opposition parties have not consistently underestimated how serious the voters of Africa’s last freed country take this franchise. Not only has the collective of Opposition parties been taught to a lesson on how serious voters take the hard earned long fought for democratic franchise, but they also told those who advocate spoiling the votes as highly irresponsible. Anyone who attempts assuming the SA voting constituency make light of the right so many fought and died for is not in step with SA as an evolving constitutional democracy. Our people know what the democratic franchise in right to vote means, they respect their right to vote and they will not entertain anyone who refuses to think along the same lines they do. Our voters are analytical and seldom vote in emotional blackmail. The conundrum Opposition Parties found them in is the reality and undeniable truth that SA is a better place today than 20 years ago or as we comfortably can say then under apartheid. They opted to rather run a negative campaign to speak in an emotional sense on the themes of corruption. Yet where they erred with this stance is when they deny the good story of the ANC, they deny their own due role in that good story, and they equally deny the voters convictions that SA is a better place today. Opposition parties try and tell the SA voters there is no good story they try and tell them you were are all deceived and the ANC has been lying to you. The challenge with this that South Africans that lived in this country and even those outside its confines confirm in many senses this good story. The DA’s Mmusi Maimane very late in his multi-million rand campaign attempted in half-hearted sense acknowledge the good story and almost broke with the mundane stereotypical every day yawns of opposition parties about SA being a failed projects. Agang-SA is trying tell SA we are a failed state in education, COPE is telling us we are failed state in governance. The EFF tells SA voters a constitutional democracy is not right for this country and they will create a complete new system. UDM tells us nothing except Pansy Tlakula is a threat to the elections when he knows that is not true. It is true that in many ways Mandela ensembles the iconic status and moral meridian for South Africans as the champion of our democracy. We may argue this for many valid reasons yet his presence wrongly or rightly looms large in the SA constituency and voting populace. All opposition parties understood this, yet they missed it in trying to dislocate and divorce him from the movement and party that made him. The DA attempted to reinvent Mandela as belonging to all in absence of history and negating how he became the president and what party made him president and his loyalty to the ANC. The DA went as far as attempting to give Mandela and Mbeki the credit for having done a good job and the current ANC destroying all the gains. What this notion misses is that the ANC is rolling out what was agreed over time at all the conferences in manifestos and we are now at this stage because we have had the previous eras who laid certain foundations. The biggest error they commit on Mandela is to bastardise his political roots to falsify him into an identity that came from space and therefore has no roots in political definition. Mandela is dead, yet he lives in SA, but he does not live outside the Movement that made him and any attempt to divorce him from the ANC is rendering you a suspicious imposter who simply doesn’t deal in truth. Opposition Parties misunderstood the Mandela factor that does not lend itself to convenient misuse, particularly in denial of the lived experience. There is a grave misconception on the part of opposition parties they naturally assume SA Voters need help to be rescued from an impending danger lurking in the party it votes for. The second aspect of this error manifests in seeing them as the saviours of these blind and deceived voters. They assume their assignment is to free the voters from their wrong thinking in still voting for the ANC. It is nothing but patronising to saythe least on the part of opposition parties. When opposition parties can first respect that voters are free and exercise that freedom every five years and has no need to be freed. Opposition parties come to the SA voters with the singular intent of rescuing them and nit to be rescued, they come to the SA voters to tell them and not to listen to them. The approach the SA voters less as if they do not have a history of voting. The conclude so much in assumption and is held carceral by their own picket fences. In conclusion for as long as the collective of opposition parties share this conclusive prism exemplified in gross misconception of the voters of the SA elections as oblivious and voting with no sense of thinking, they will learn how much the masses think. For as long as they hold on to these preconceived notions of SA voters as easily misled in the road trudged, they will be punished in the polls. If the argument is made that we need a re-haul of ruling party the similar counter argument can be raised we need a remake of what is defined as opposition parties in SA. It is perhaps befitting to conclude in asking what informs the role of Opposition Parties in a democracy. Why the Freedom Front may have an unexpected windfall in Elections 2014! This election in my opinion holds an unexpected surprise for most. While many gloat in anticipation of how the ANC will be upstaged by new EFF, I think we omitting to read the signs of the times in Opposition party definition. It is my view that the surprise in election embrace will come from the Freedom Front growth. The Freedom Front can be considered the last frontier of apartheid thinking in current political context. It will show a marked increase in vote due to three dominant reasons. The DA leadership has increasingly irritated a primary constituency that joined them less of political ideological pragmatism but almost forced-choice of limited political space. This group ensembles those who in this era defines themselves as an “Afrikaner” constituency who in a sense has used the DA as hideout because they did not want to be openly seen as against transformation for a litany of reasons. This group in my assessment remains soft belly of the DA. It is my view that contrary to what the DA wants SA to believe, black voter growth is not the true reason for its growth. It is this constituency who had accidently found a place in the DA’s blanket of liberalism, the same they will never be. If we accept the history of the English and Afrikaans politics, it was in a sense a stroke of genius to have managed to become the voice for a conflated constituency representative of these two groups. The DA in this season in an increasing sense is annoying its ‘Afrikaner’ constituency that will in their own way deem it their right to punish Helen’s obsession with a black face for the DA, confusion on employment equity policy and many other issues such as the Afrikaans language. The emergence of the EFF with its hardened rhetoric of nationalization and unconstitutional manifesto wish list of programmes has solidified the need for this group to come out of the closet. I am contending the presence of an EFF if it was like a UDM or a COPE even a Agang-SA, would not have propelled this action because the former mentioned poses no direct threat to the existence of this group perceptively seen from their angle. The EFF has been clear in its stance and given the media coverage; it gets makes more and more of this group jittery in expressing a fear should the eff for whatever reason emerge. We know the latter is highly improbable regardless to how the media profile the EFF. In my assessment I foresee the presence of the EFF solicits a response in hardened stance from the ‘Afrikaner’ voters constituency. They therefore will not see the DA as the viable option to articulate or communicate this hardened ideological stance. The claim of 20 years of non-delivery of the ANC (we know this is not true) but at a sentimental level has given this group a right to legitimately claim that SA was better under apartheid. The sentiment of this notion ignites a sense of honour and pride among some who were castigated as the underwriters of apartheid to emerge from the enclave of the DA and find a political home that at an ideological level resonates with them. In addition, having such a conviction in ideology has become legitimized in a constitutional democracy rendering the fear of being ostracised for being old fashioned and conservative is a today not that more radical. • The question becomes since this constituency finds itself in the DA and have voted for the DA in swelling of its ranks over the period of the last 20 years, where will they next find a home? • The question becomes if they are feeling threatened and vulnerable with the emergence of a boisterous EFF and is afforded a right to resort back to a laager mentality a common tendency if the history of this group is understood, how will they respond to this! • If they feel almost vindicated by the parading claims of non-delivery and some convinced of apartheid as better, what will this do to their psyche if anything at all? It is here that I think the Freedom Front may become the benefactor of this growing phenomenon. The Afrikaner group is not necessarily a homogenous group that all vote the same, for its long exposure to the right to vote coupled with the divergent ideological stances renders them capable of punishing the DA. Some may ask why the Freedom Front, the answer is simple. It is highly unlikely that this group will start a new party, they therefore will look at a legitimate structure already operating and part of the constitutional democracy party political footprint. The likes of Solidarity and Agri-Forum as NGO structures are more ideologically linked to a Freedom Front than a Democratic Alliance and could be the very critical linkages for the crossover and even walk out from the DA. I therefore anticipate that the Freedom Front is likely to have more seats in parliament come May 8, 2014. I would not be surprised if this translates to the DA losing 4 – 5% of its voter base to the Freedom Front.